For the 2005 oil refinery fire, see Texas City Refinery explosion. The Texas City disaster was an industrial accident that occurred April 16, 1947 in the Port of Texas City, Texas, at Galveston Bay. It was the deadliest industrial accident in U.S. history, and one of history's largest non-nuclear explosions. A mid-morning fire started on board the French-registered vessel SS Grandcamp (docked in the port), and detonated her cargo of approximately 2,200 tons (approximately 2,100 metric tons) of ammonium nitrate. This started a chain-reaction of additional fires and explosions in other ships and nearby oil-storage facilities. The events killed a total of at least 581 people, including all but one member of the Texas City fire department. The disaster triggered the first ever class action lawsuit against the United States government, under the recently enacted Federal Tort Claims Act (FTCA), on behalf of 8,485 victims. The Grandcamp was a recently re-activated 437-foot-long (133 m) Liberty ship. Originally named the SS Benjamin R. Curtis in Los Angeles in 1942, the ship served in the Pacific theatre and was mothballed in Philadelphia after World War II. In a Cold War gesture, the ship was assigned by the United States to the French Line to assist in the rebuilding of France, along with other efforts in Europe. Along with the ammonium nitrate—a very common cargo on the high seas—it was carrying small arms ammunition, machinery, and bales of sisal twine on the deck. Another ship in the harbor, the SS High Flyer, was docked about 600 feet (200 m) away from the SS Grandcamp. The High Flyer contained an additional 961 short tons (872 metric tons) of ammonium nitrate and 1,800 short tons (1,600 metric tons) of sulfur. The ammonium nitrate in the two ships and fertilizer in the adjacent warehouse was intended for export to farmers in Europe. The Grandcamp had arrived from Houston, where the port authority did not permit loading of ammonium nitrate. The ammonium nitrate, needed either as fertilizer or an explosive, was manufactured in Nebraska and Iowa and shipped to Texas City by rail before being loaded on the Grandcamp. It was manufactured in a patented process, mixed with clay, petrolatum, rosin and paraffin wax to avoid moisture caking. It was packaged in paper sacks, then transported and stored at higher temperatures that increased its chemical activity. Longshoremen reported the bags were warm to the touch before loading. On April 16, 1947, around 8:00 a.m. smoke was spotted in the cargo hold of the Grandcamp while she was still moored. Over the next hour, attempts to extinguish the fire or bring it under control failed as a red glow returned after each effort to douse the fire. Shortly before 9:00 a.m., the captain ordered his men to steam the hold, a firefighting method where steam is piped in to extinguish fires, in order to preserve the cargo. This was unlikely to be effective, as ammonium nitrate produces its own oxygen, thus neutralizing the extinguishing properties of steam. The steam may have contributed to the fire by converting the ammonium nitrate to nitrous oxide, while augmenting the already intense heat in the ship's hold. The fire attracted spectators along the shoreline, who believed they were at a safe distance. Eventually, the steam pressure inside the ship blew the hatches open, and yellow-orange smoke billowed out. This color is typical for nitrogen dioxide fumes. The unusual color of the smoke attracted more spectators. Spectators also noted that the water around the docked ship was boiling from the heat, and the splashing water touching the hull was being vaporized into steam. The cargo hold and deck began to bulge as the pressure of the steam increased inside. At 9:12 a.m., the ammonium nitrate reached an explosive threshold from the combination of heat and pressure. The vessel detonated, causing great destruction and damage throughout the port. The tremendous blast produced a 15-foot (4.5 m) wave that was detectable nearly 100 miles (160 km) off the Texas shoreline. The blast leveled nearly 1,000 buildings on land. The Grandcamp explosion destroyed the Monsanto Chemical Company plant and resulted in ignition of refineries and chemical tanks on the waterfront. Falling bales of burning twine from the ship's cargo added to the damage and the Grandcamp's anchor was hurled across the city. Two sightseeing airplanes flying nearby had their wings shorn off, forcing them out of the sky. 10 miles (16 km) away, half of the windows in Galveston were shattered. The explosion blew almost 6,350 short tons (5,760 metric tons) of the ship's steel into the air, some at supersonic speed. Official casualty estimates came to a total of 567, including all the crewmen who remained aboard the Grandcamp. All but one member of the 28-man Texas City volunteer fire department were killed in the initial explosion on the docks while fighting the shipboard fire. With fires raging throughout Texas City, first responders from other areas were initially unable to reach the site of the disaster. The first explosion ignited ammonium nitrate in the nearby cargo ship High Flyer. The crews spent hours attempting to cut the High Flyer free from her anchor and other obstacles, in order to move her, without success. 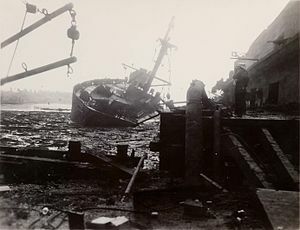 After smoke had been pouring from the hold for over five hours, and about 15 hours after the explosions aboard the Grandcamp, the High Flyer exploded, demolishing the nearby SS Wilson B. Keene, killing at least two more persons and increasing the damage to the port and other ships with more shrapnel and burning material. One of the propellers on the High Flyer was blown off and subsequently found nearly a mile inland. It is now part of a memorial park and is located near the anchor of the Grandcamp. The propeller is cracked in several places, and one blade has a large piece missing. The cause of the initial fire on board the Grandcamp was never determined. It may have been started by a cigarette discarded the previous day, meaning the ship's cargo had been smouldering throughout the night when the fire was discovered on the morning of the day of the explosion. The Texas City disaster is generally considered the worst industrial accident in American history. Witnesses compared the scene to the fairly recent images of the 1943 air raid on Bari and the much larger devastation after the atom bomb was dropped at Nagasaki. Of the dead, 405 were identified and 63 have never been identified. The latter remains were placed in a memorial cemetery in the north part of Texas City near Moses Lake. An additional 113 people were classified as missing, for no identifiable parts were ever found. This figure includes firefighters who were aboard Grandcamp when she exploded. There is some speculation that there may have been hundreds more killed but uncounted, including visiting seamen, non-census laborers and their families, and an untold number of travelers. But there were also some survivors among people as close as 70 feet (21 m) from the dock. The victims' bodies quickly filled the local morgue. Several bodies were laid out in the local high school's gymnasium for identification by family or friends. More than 5,000 people were injured, with 1,784 admitted to 21 area hospitals. More than 500 homes were destroyed and hundreds damaged, leaving 2,000 homeless. The seaport was destroyed, and many businesses were flattened or burned. Over 1,100 vehicles were damaged and 362 freight cars were obliterated; the property damage was estimated at $100 million (equivalent to $1,100,000,000 in 2018). A 2-short-ton (1.8-metric-ton) anchor of Grandcamp was hurled 1.62 miles (2.61 km) and found in a 10-foot (3 m) crater. It was installed at a memorial park. The other main 5-short-ton (4.5-metric-ton) anchor was hurled 1⁄2 mile (800 m) to the entrance of the Texas City Dike. It rests on a "Texas-shaped" memorial at the entrance. Burning wreckage ignited everything within miles, including dozens of oil storage tanks and chemical tanks. The nearby city of Galveston, Texas, was covered with an oily fog that left deposits over every exposed outdoor surface. Some of the deaths and damage in Texas City were due to the destruction and subsequent burning of several chemical plants (including Monsanto and Union Carbide), oil storage, and other facilities near the explosions. 27 of the 28 members of Texas City's volunteer fire department and 3 of 4 members of the Texas City Heights Volunteer Fire Department who were on the docks near the burning ship were killed. One firefighter, Fred Dowdy, who had not responded to the initial call, coordinated other firefighters arriving from communities up to 60 miles (100 km) away. Alvin Fussell, sole survivor of the Heights Volunteer fire fighters, was driving to work in Alvin when he heard of the fire on the radio. Eventually 200 firefighters arrived, from as far away as Los Angeles. Fires resulting from the cataclysmic events were still burning a week after the disaster, and the process of body recovery took nearly a month. All four fire engines of Texas City were twisted and burned hulks. The disaster gained attention from the national media. Offers of assistance came in from all over the country. Several funds were established to handle donations, particularly the Texas City Relief Fund, created by the city's mayor Curtis Trahan. One of the largest fundraising efforts for the city and the victims of the disaster was organized by Sam Maceo, one of the two brothers who ran organized crime in Galveston at the time. Maceo organized a large-scale benefit on the island featuring some of the most famous entertainers, including Phil Harris, Frank Sinatra, and Ann Sheridan. In the end, the Texas City Relief Fund raised more than $1 million ($11.9 million in today's terms). Payouts for fire insurance claims reached nearly $4 million ($44.4 million in today's terms). Within days after the disaster, major companies that had lost facilities in the explosions announced plans to rebuild in Texas City and even expand their operations. Some companies implemented policies of retaining all of the hourly workers who had previously worked at destroyed facilities with plans to use them in the rebuilding. In all, the expenditures for industrial reconstruction were estimated to have been approximately $100 million ($1.12 billion in today's terms). Hundreds of lawsuits were filed as a result of the disaster. Many of them were combined into Elizabeth Dalehite, et al. v. United States, under the recently enacted Federal Tort Claims Act (FTCA). On April 13, 1950, the district court found the United States responsible for a litany of negligent acts of omission and commission by 168 named agencies and their representatives in the manufacture, packaging, and labeling of ammonium nitrate, further compounded by errors in transport, storage, loading, fire prevention, and fire suppression, all of which led to the explosions and the subsequent carnage. On June 10, 1952, the U.S. Fifth Circuit Court of Appeals overturned this decision, finding that the United States maintained the right to exercise its own "discretion" in vital national matters. The Supreme Court affirmed that decision (346 U.S. 15, June 8, 1953), in a 4-to-3 opinion, noting that the district court had no jurisdiction under the federal statute to find the U.S. government liable for "negligent planning decisions" which were properly delegated to various departments and agencies. In short, the FTCA clearly exempts "failure to exercise or perform a discretionary function or duty", and the court found that all of the alleged acts in this case were discretionary in nature. In its dissent, the three justices argued that, under the FTCA, "Congress has defined the tort liability of the government as analogous to that of a private person," i.e., when carrying out duties unrelated to governing. In this case, "a policy adopted in the exercise of an immune discretion was carried out carelessly by those in charge of detail," and that a private person would certainly be held liable for such acts. It should also be noted that a private person is held to a higher standard of care when carrying out "inherently dangerous" acts such as transportation and storage of explosives. According to Melvin Belli in his book Ready for the Plaintiff! (1965), Congress acted to provide some compensation after the courts refused to do so. The Dalehite decision was eventually "appealed" to Congress, where relief was granted by means of legislation (Public Law 378, 69 Stat. 707 (1955)). When the last claim had been processed in 1957, 1,394 awards, totaling nearly $17,000,000, had been made. Smoke from the fires, seen from a distance. Wreckage of the Wilson B. Keene. The large piece of wreckage in the foreground may be from the Grandcamp. A business destroyed by the explosion. Vehicles outside the relief center after the explosion. Motor vehicles damaged by the explosion. Abandoned street, showing extensive damage from the explosion. A five-story rubber factory beside slip #1. The disaster was the subject of a book, City on Fire: The Explosion that Devastated a Texas Town and Ignited A Historic Legal Battle, by presidential biographer and historian Bill Minutaglio. The actor Tom Cruise optioned the book when it was published in 2003. ^ a b c d "Texas City, Texas Disaster". Fire Prevention and Engineering Bureau of Texas. April 29, 1947. Retrieved 2014-12-29. ^ Stephens, Hugh W. (1997). The Texas City Disaster, 1947. University of Texas Press. p. 100. ISBN 0-292-77723-X. ^ "Fire on the Grandcamp". Moore Memorial Public Library. Retrieved 2014-12-29. ^ "Pyrotechnics, Explosives & Fireworks". Greg Goebel / Advameg, Inc.
^ Lienhard, John H. (1996). Engines of our Ingenuity: No. 1138: The Texas City Disaster. Radio broadcast: University of Houston. ^ "The First Explosion - 1947 Texas City Disaster". www.texascity-library.org. 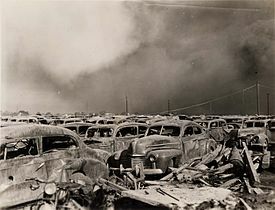 ^ "Fertilizer explosion kills 581 in Texas - Apr 16, 1947 - HISTORY.com". ^ a b c d Stephens (1997), p. 104–105. ^ McComb, David G. (2000). Galveston: a history and a guide. Austin: University of Texas Press. p. 176. ISBN 0-292-72049-1. ^ Minutaglio, Bill (2003). City on Fire: The Explosion That Devastated a Texas Town and Ignited a Historic Legal Battle. Harper. p. 201. ISBN 978-0-06-095991-3. ^ "Public Law 378 Chapter 864 69 Stat. Page 707" (PDF). ^ Bing, Jonathan (9 June 2003). "Cruise/Wagner spark to 'Fire'". Olafson, Steve. "THE EXPLOSION: 50 YEARS LATER, TEXAS CITY STILL REMEMBERS/'Texas City just blew up'/A powerful chemical explosion 50 years ago propelled a small port town into an unwelcome national and world spotlight." Houston Chronicle. Sunday April 13, 1997. Special 2. Gonzales, J.R. "Newly discovered photos show extent of destruction at Texas City." Houston Chronicle. April 16, 2010.